This evaluation is presented as part of the Effectiveness Review Series 2014/15, randomly selected for review under the citizen voice thematic area. This report documents the findings of a qualitative impact evaluation, carried out in December 2014. 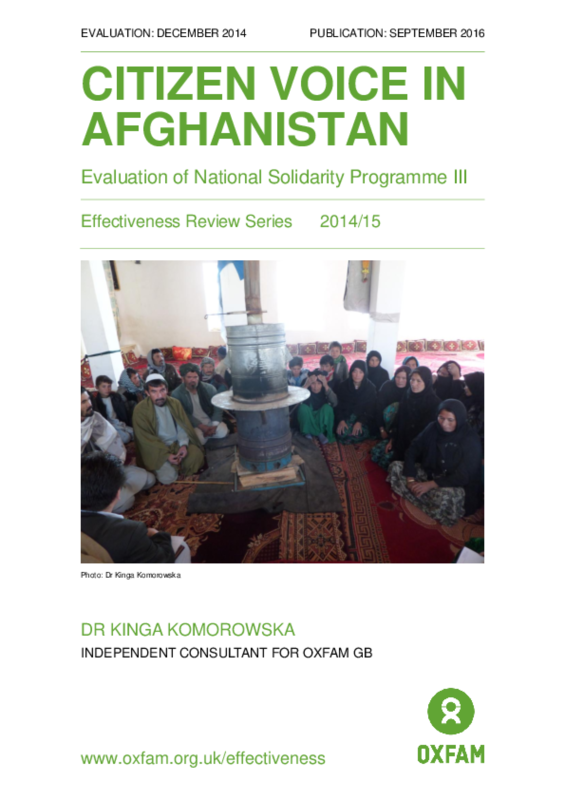 The evaluation used process tracing to assess the effectiveness of the "National Solidarity Programme III" in Afghanistan. The National Solidarity Programme III (NSP III) was launched in 2003 by the Ministry of Rural Rehabilitation and Development (MRRD). The main objective of the programme was "'to build, strengthen and maintain community development councils (CDCs) as effective institutions for local governance and socio- economic development"'. Oxfam GB was a Facilitating Partner, helping to establish and build the capacity of CDCs to manage local development.